It was touch-and-go at times but, in the end, Notts County did all that was asked of them and preserved their League One status for another season. They went into action at Oldham knowing that one point would be sufficient for them to avoid a place in the bottom four - and with it relegation to League Two. A fantastic following of over 3,361 fans accompanied Notts to the North-West of England and seven minutes in the second half tested their endurance. After a drab first half it brightened considerably after the interval and, though playing better, Notts were stunned when Oldham took the lead in the 68th minute. A free kick, rashly conceded half way inside the Notts half, floated across the Notts goal for defender Adam Lockwood, unmarked, to best goalkeeper Bar Bialkowski with a header. The next seven minutes were the worst, and the longest, for the travelling fans until Notts were awarded a penalty for a handling offence. Alan Sheehan, who has failed with only one penalty all season, showed all his coolness and composure by firing Notts level. 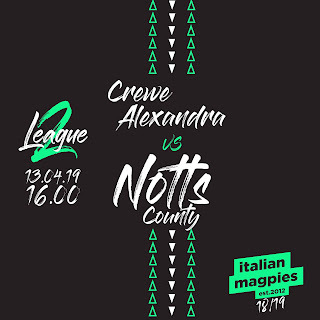 Oldham were reduced to ten men when Lockwood was sent off for a second yellow card offence and Notts created the better chances in the closing stages but could not add to their lead. It was already known that Stevenage and Shrewsbury were relegated and today's results saw Carlisle and Tranmere join them. The final whistle at Oldham brought huge outpourings of relief and joy on the part of Notts supporters with manager Shaun Derry being greeted like a conquering hero. 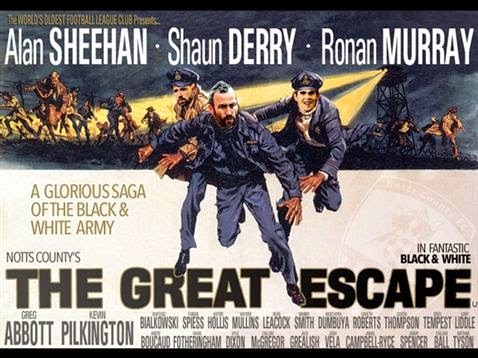 Notts chairman Ray Trew revealed after the game that the club had feared relegation so strongly at one stage they had put plans in place for League Two football next season and described his overall reaction to the completion of the Great Escape as one of relief.